It appears that the silly human has finally managed to find some new breakfast foods that are not just “acceptable” but rather are “enjoyable” — extremely so. Hallalujah! 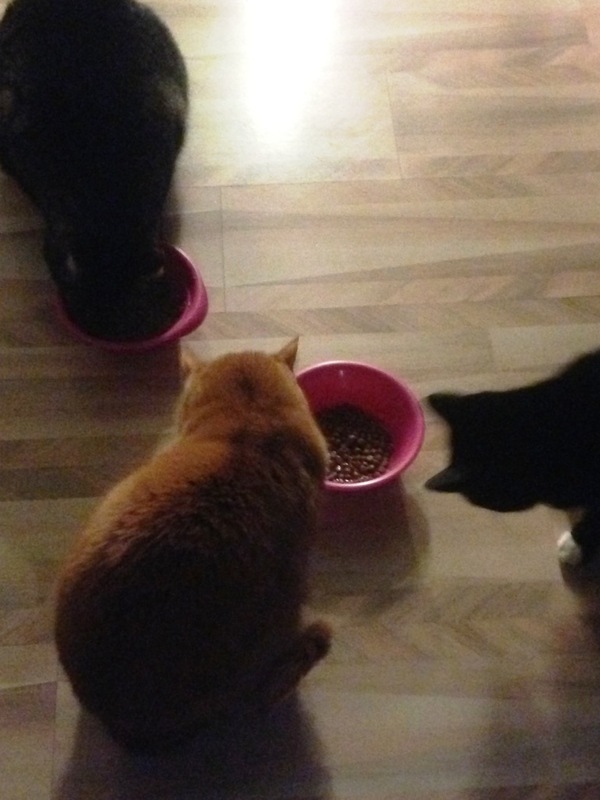 The kitties have been enjoying them so much, that breakfast bowls have been flying across the floor more at the speed of a game of hockey than shuffle puck. 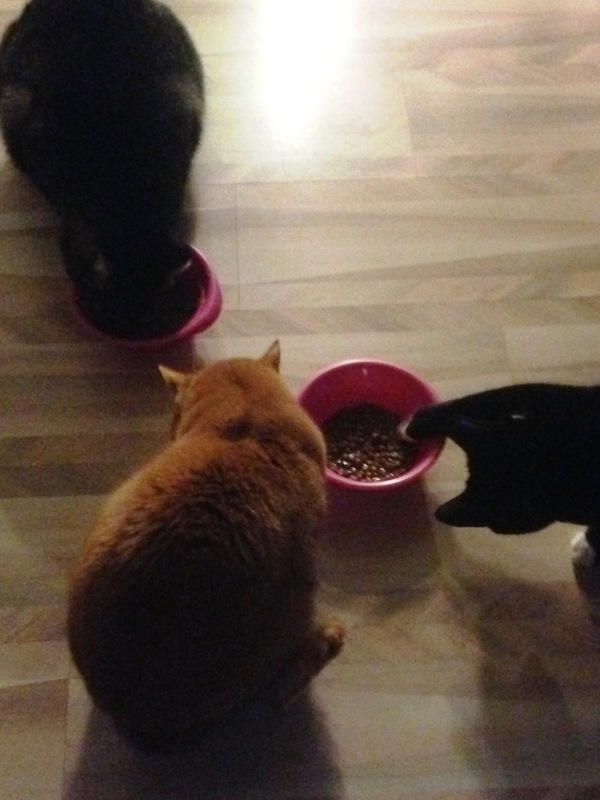 And for better or worse, it appears that Macaroni has taught Fireball how to snag hunks of wet food directly from the bowl and eat them off his paws. Of course, with both he and Mac repeatedly pulling the bowl out from under each other (and Caesar if he’s not at a different bowl), and then swiping a paw full of wet food out of the bowl, the kitchen floor quickly becomes a real mess. 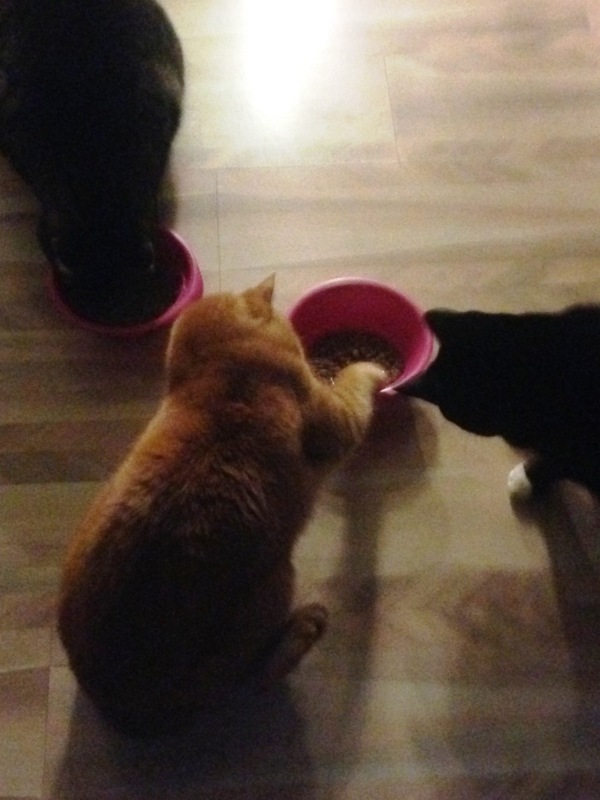 As Fireball eats the food off his paw, Mac, who has just finished her own pawful, is dipping her foot back into the bowl so she can pull it out of her brother’s reach and grab a new hunk to eat. 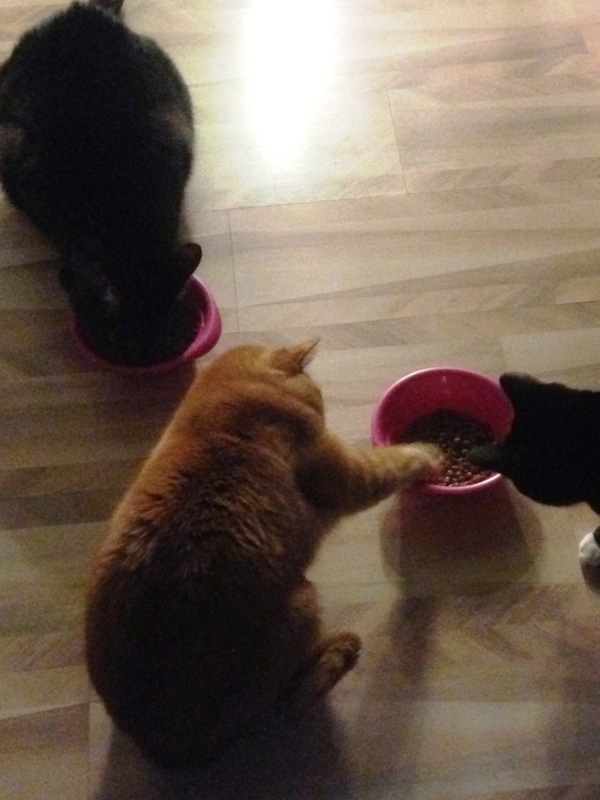 Next, Mac eats off her paw and Fireball pulls the bowl away from her. With bowl repositioned, he reaches in for another fistful as Mac finishes her latest grab. And on and on it goes while the bowl or bowls move all around the kitchen floor. Breakfast is so much fun in this house. 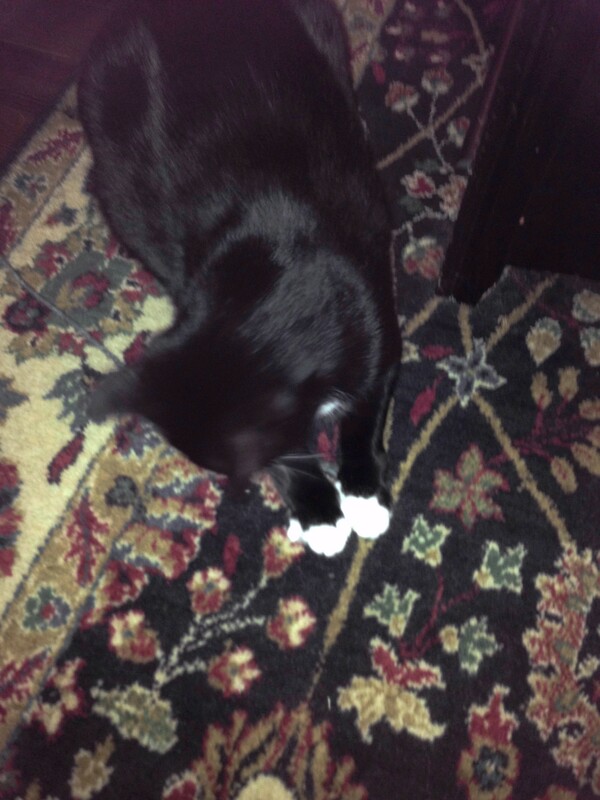 Miss Mac(aroni) was chasing a toy mouse tied with a string that I kept tossing up onto one of my couches. 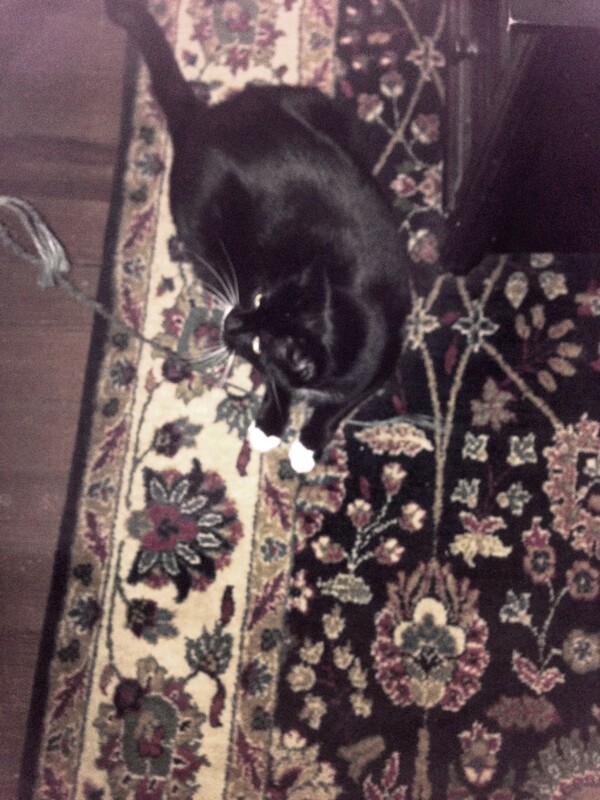 She’d leap up, snag the string with one of her sharp little claws, and then pull the toy down for a tumble. Unfortunately for her, on one leap, as she reached out to snag the string, she actually got hooked in a pillow, which came tumbling over on top of her along with the toy. Boy was she surprised and a little confused! (And the silly human was laughing so hard she missed the photo opp.) It wasn’t a heavy pillow so all was soon fine, but that ended the game for the day. The silly human found a pile of old metal coat hangers in the basement and was on the way out the door to put them in the recycle bin. As she stepped out on the deck, what greeted her (quite close to the deck) but a large buck (male deer) with 8 points on its horns. The deer and the human eyed each other, and the human blinked and returned to the house figuring the coat hangers could be recycled another time. Of course, the human then tried to photograph the deer through the kitchen window, which did not work out quite so well as she’d hoped. Nonetheless, the deer went back to eating some apples no longer in their prime that the human had put out for the wildlife, then it lay down by the deck and stayed for an hour or more. Let me tell you, the feline guardians were not missing any of this. 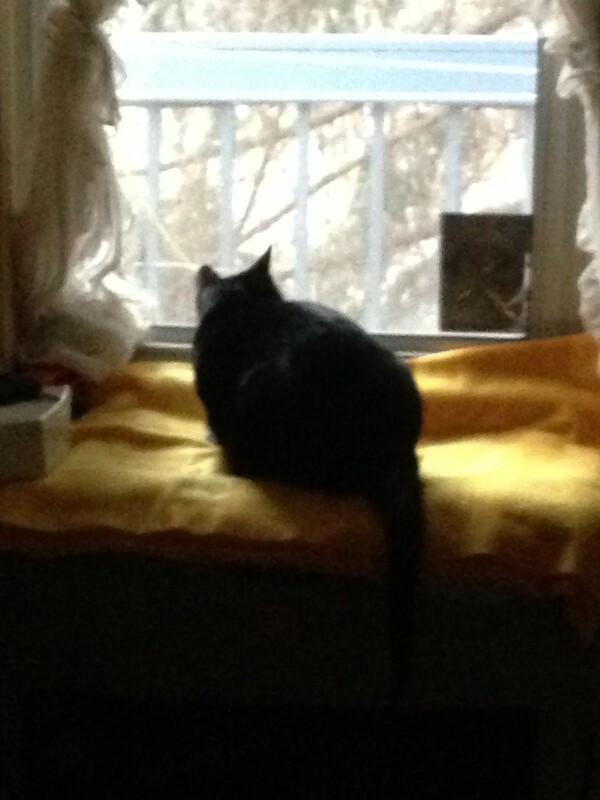 You can see Macaroni all jazzed up looking out at this large animal that has clearly invaded HER yard! 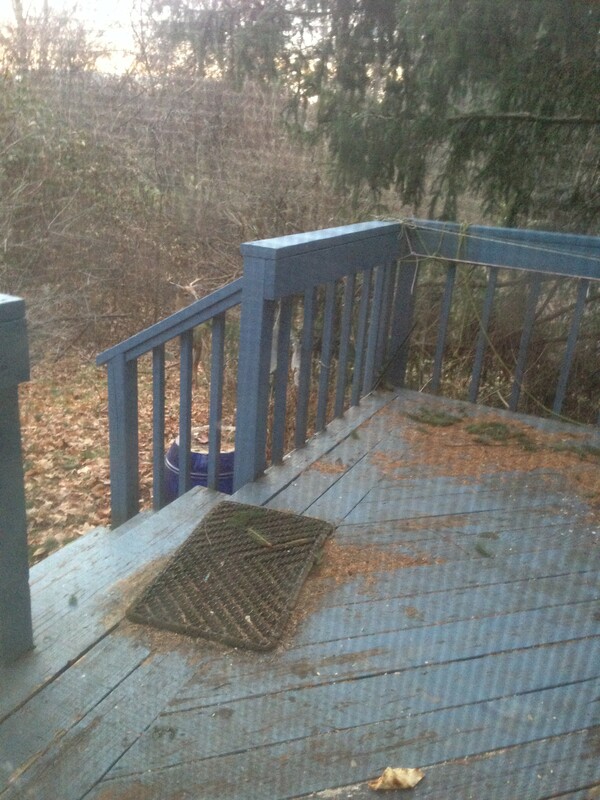 Eventually, several hours later, the deer did get up and leave. 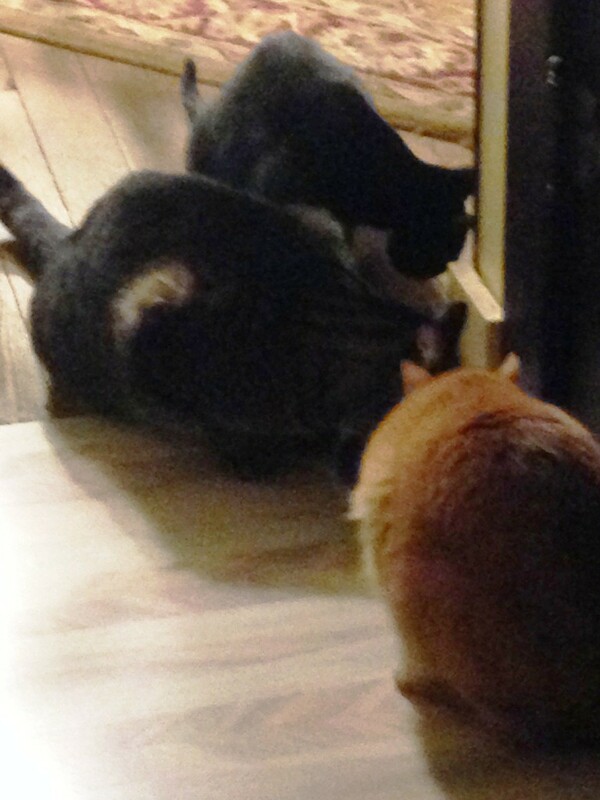 And the kitty guardians prevented the silly large beast from entering the house. Such good watch-kitties! Great excitement! Within 10 minutes, there were nothing but crumbs left. 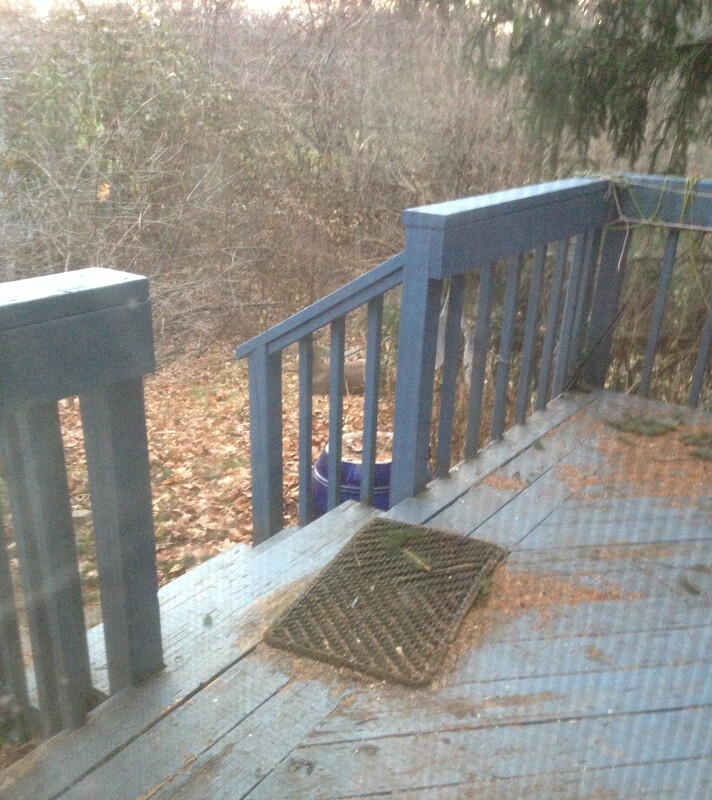 And need I mention that the bowl was not placed in that location on the floor? Yes, it moved this way and that as one after another of the cats hooked a paw into the lip of the bowl and pulled it out from under the other two to get a bite to eat. They are so entertaining in the morning!